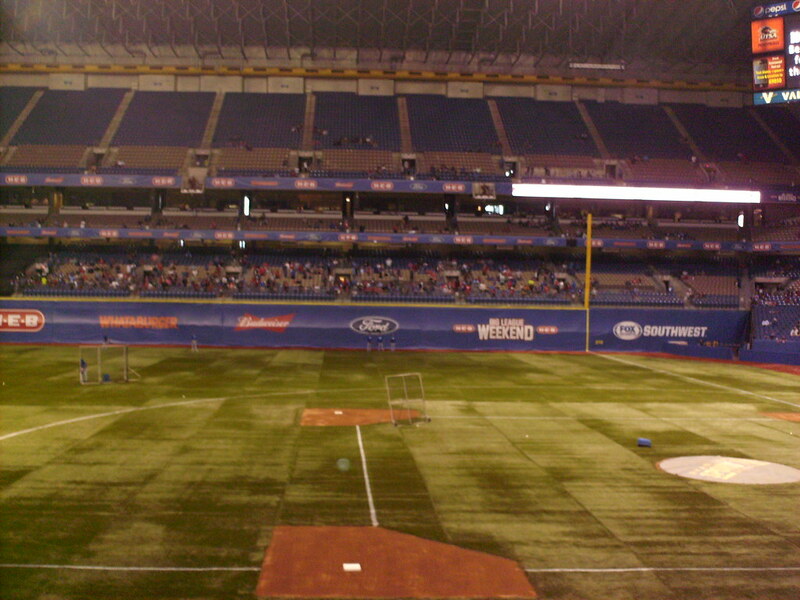 The view from behind home plate at The Alamodome. 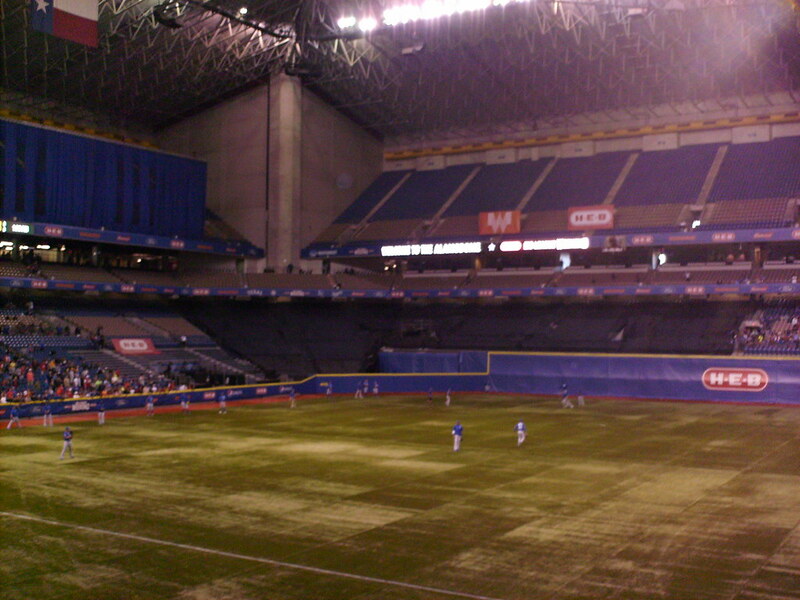 The stands at The Alamodome, as seen from center field. 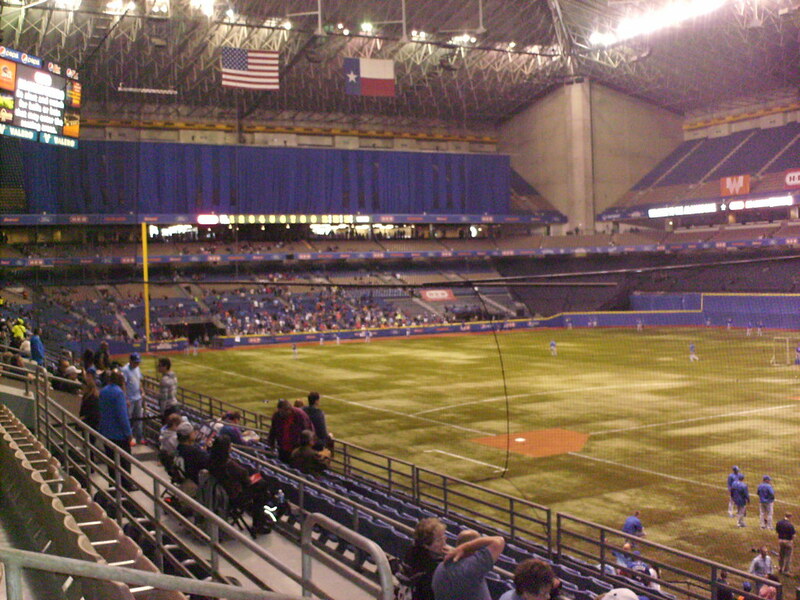 As The Alamodome is primarily configured as a football stadium the area directly behind home plate features limited seating. 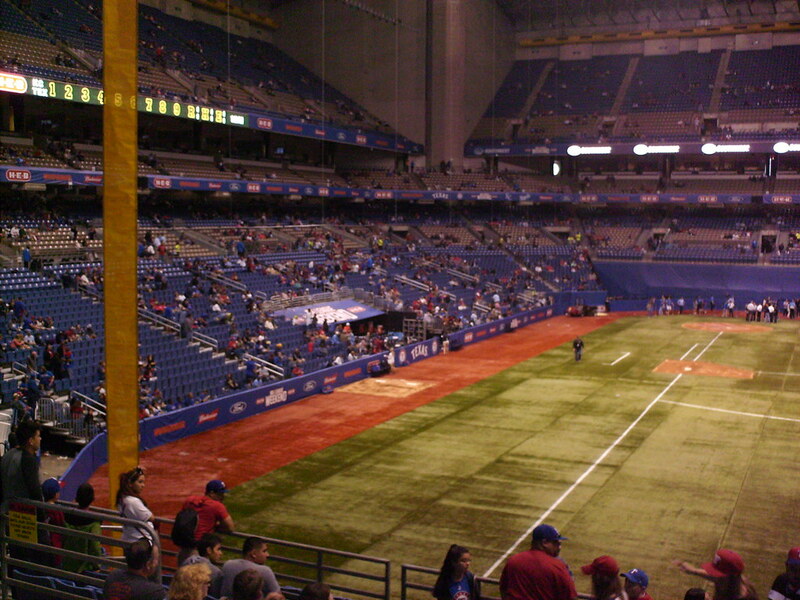 Where there is usually prime seating at a ballpark is instead taken up by the concrete corner support pole. 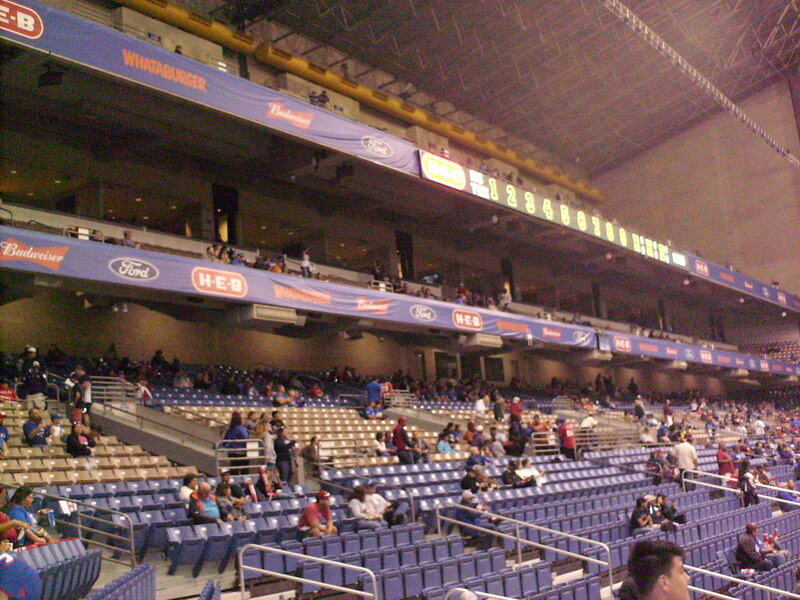 The pressbox is located among the stands on the third base side of the field. 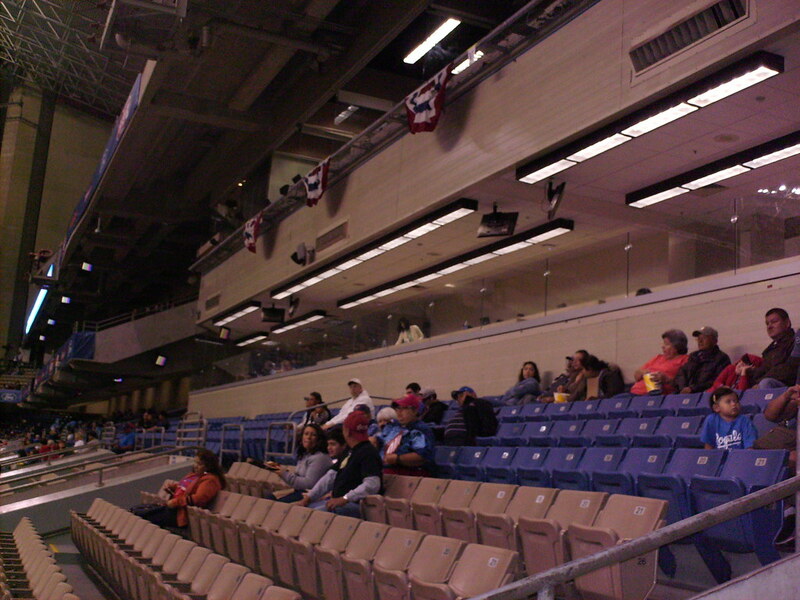 Luxury suites ring the rest of the perimeter of the building in the area underneath the upper deck. 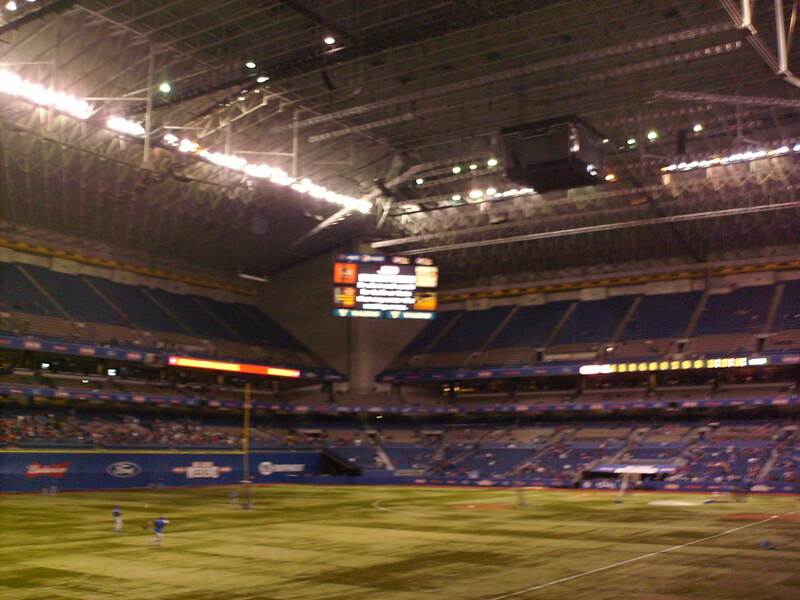 The football setup means that stands running along the first base line stretch all the way down to the field while the fans on the third base side sit high above ground level. 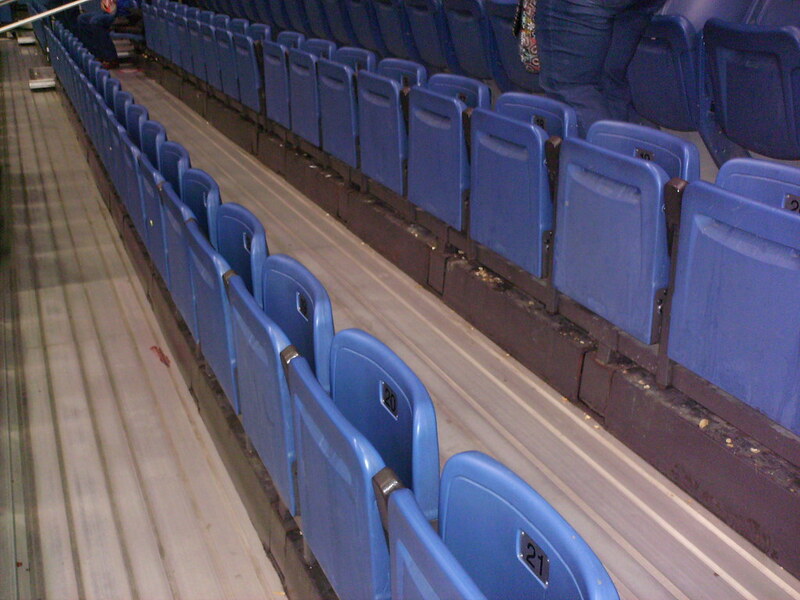 The stands can be moved to accommodate different building setups, so some seats can be folded flat for storage. 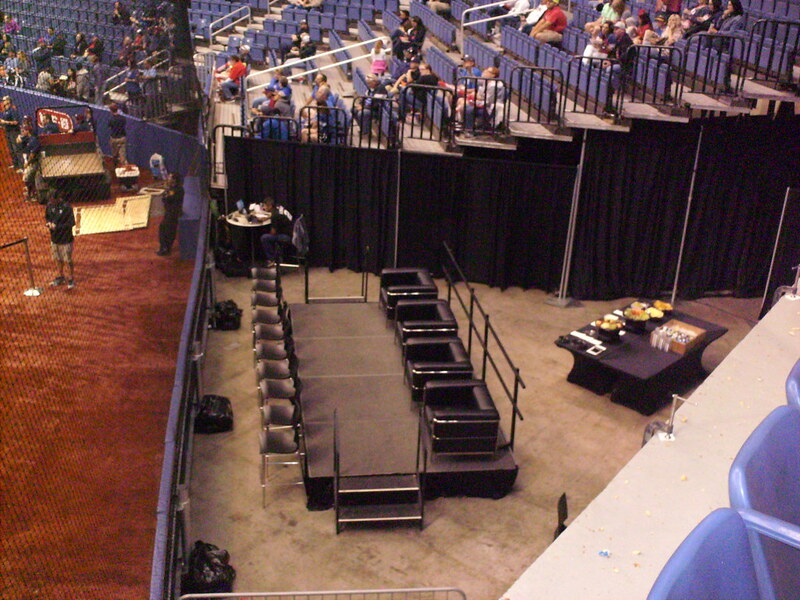 A temporary luxury box is set up in the corner between the stands behind home plate. 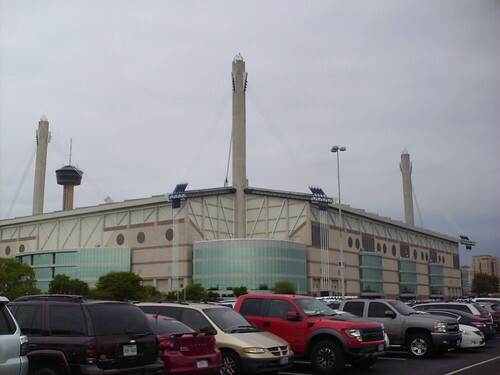 The roof of The Alamodome features lots of catwalks and supports, meaning balls can and do get stuck in the structures. 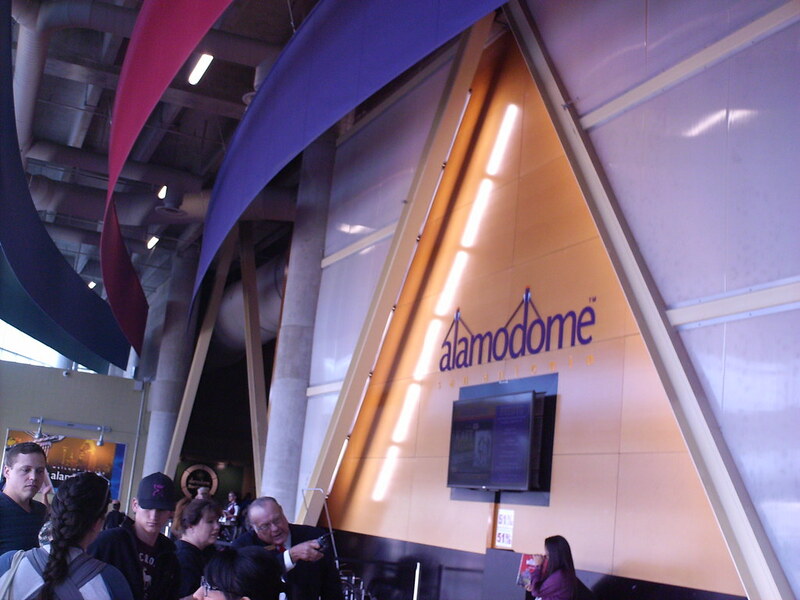 The concourse and entry plaza inside The Alamodome. 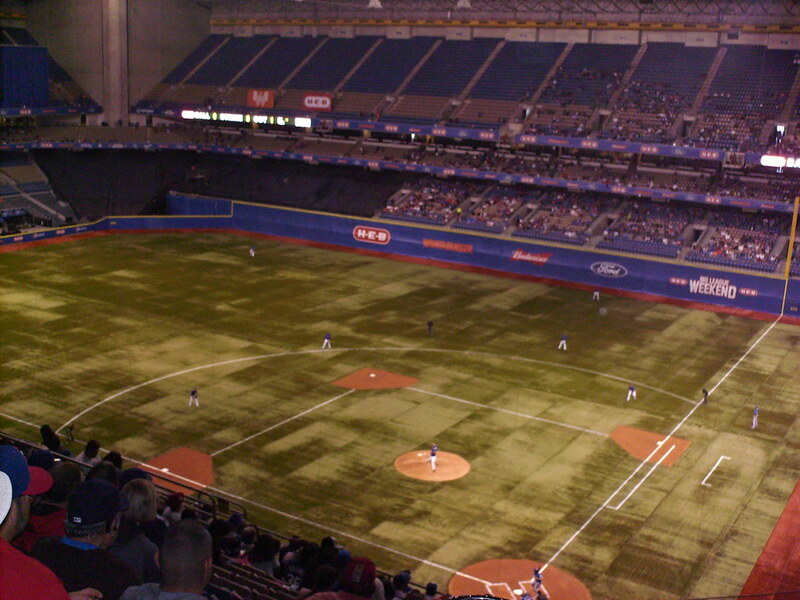 The stadium hosts only 2 baseball games a year during the Rangers' "Big League Weekend". Artificial turf in individual squares is brought in and laid down to create the playing field. 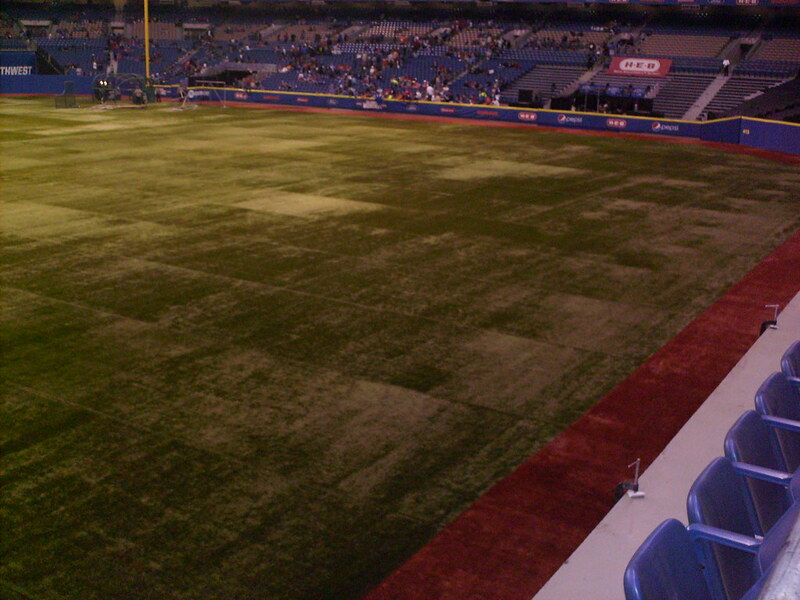 Dirt cutouts in the turf provide sliding pits around the bases and a natural pitcher's mound, but the warning tracks are colored turf. 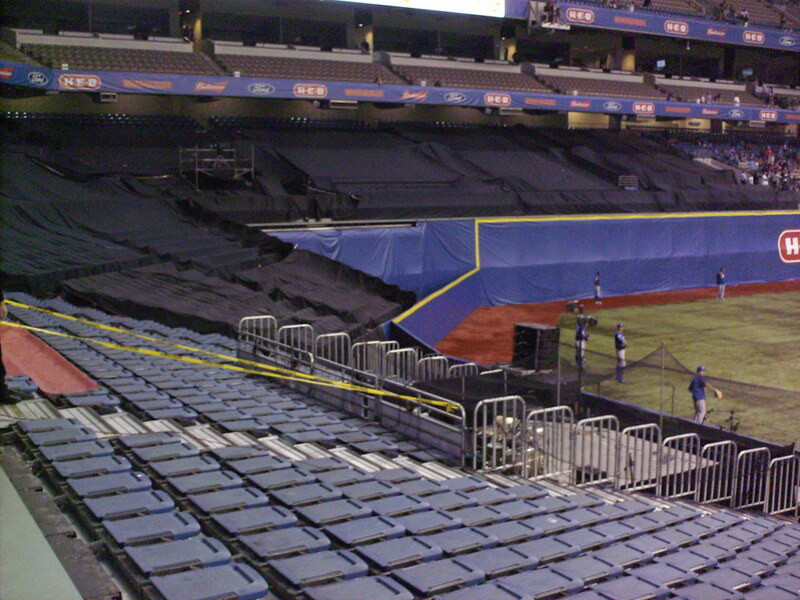 The batter's eye is formed by laying black fabric over unused seating sections behind center field. 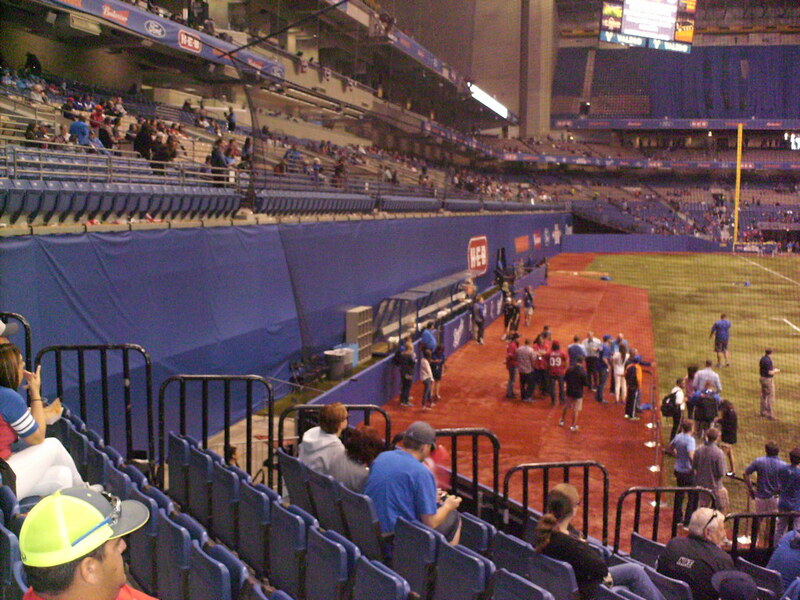 The visiting dugout is a covered bench set up behind a temporary wall in foul territory. 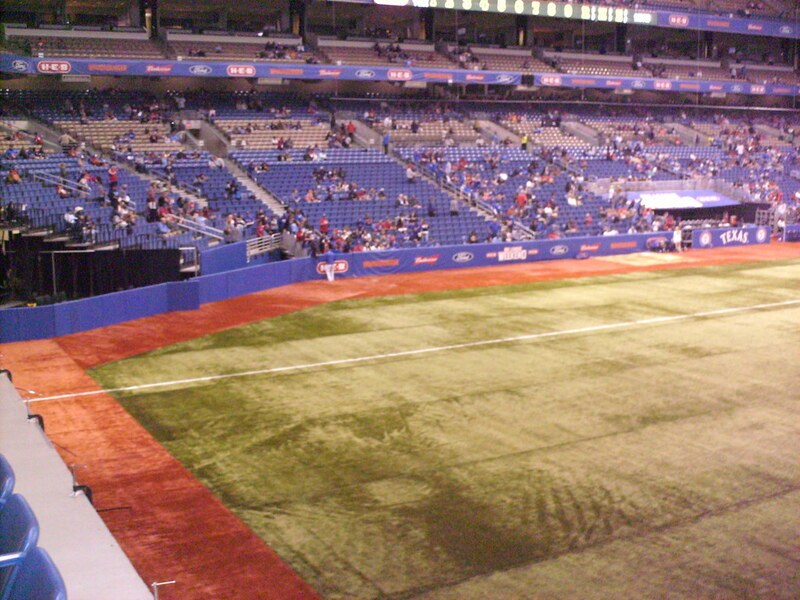 The Rangers dugout is a series of risers set back into the stands along the first base line. 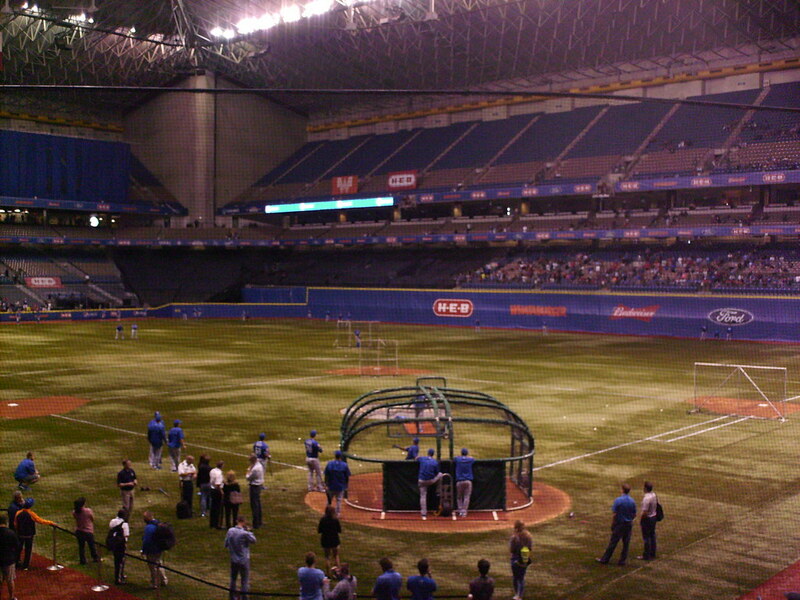 The unique field setup leads to wide swaths of foul territory which include bullpens in play next to the dugouts. 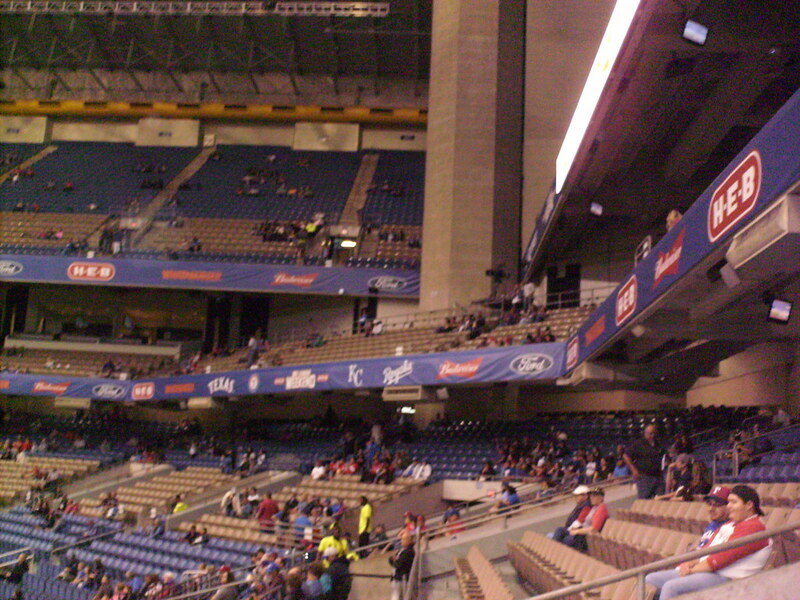 Cloth foul poles stretch down from the ceiling. 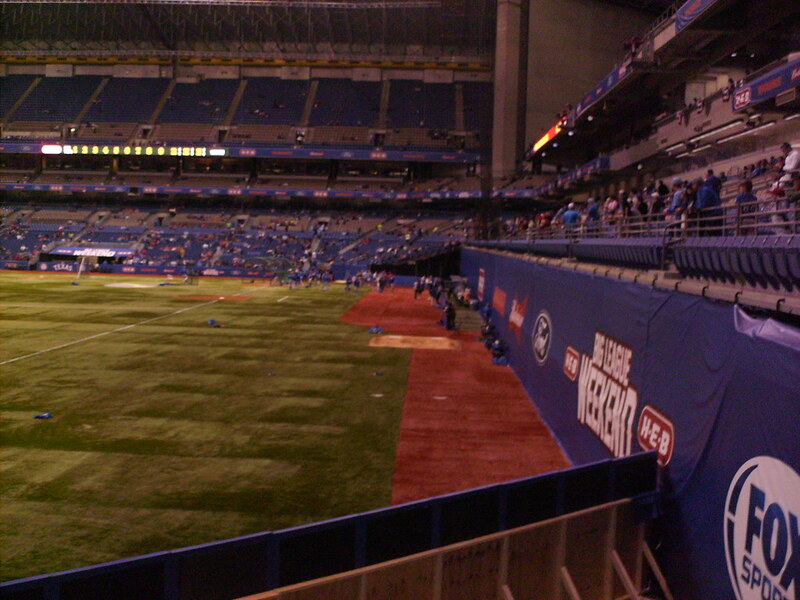 The confines of the football field setup mean its a short 272 feet to the 16 foot tall wall in right field. 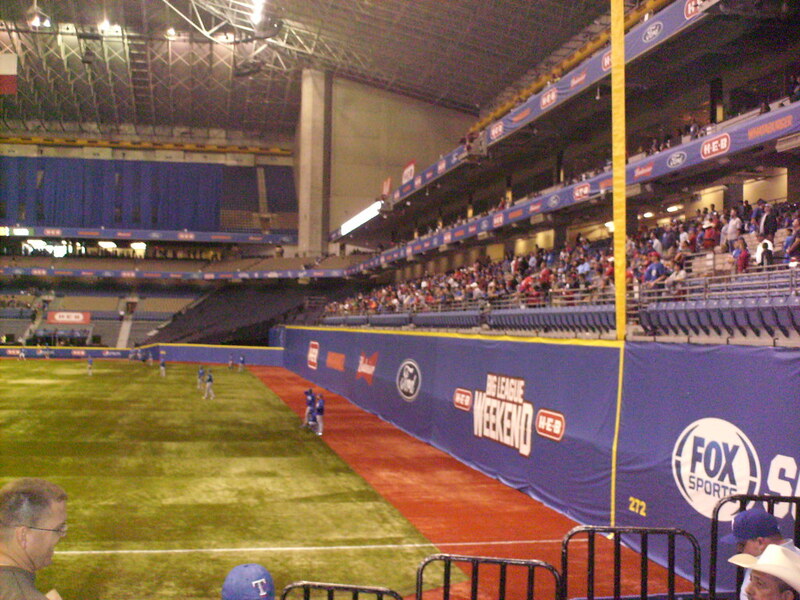 The outfield fence decreases in height several times as it moves from the shallow right field to the deeper left field. The scoreboard sits in the right field corner of the stadium. 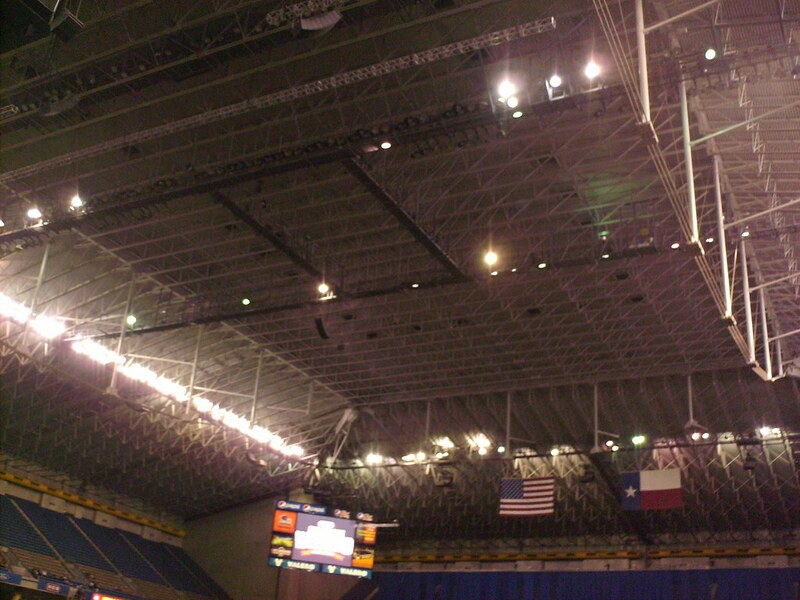 A basketball scoreboard sits unused at the roof of the building. 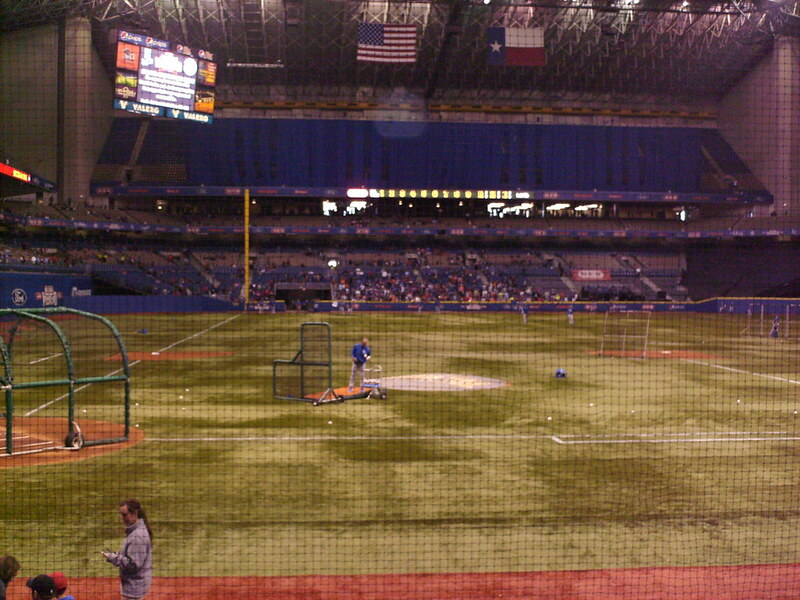 The Texas Rangers on the field during Big League Weekend at The Alamodome. 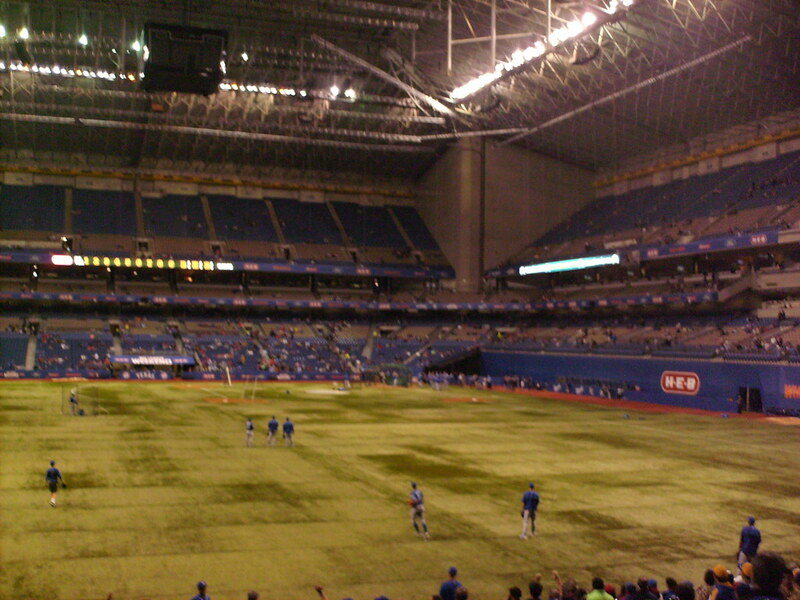 The two game Spring Training series is only time the building sees use as a baseball park.